The much-awaited OnePlus 5 finally launched on Tuesday, putting an end to months of speculation surrounding the handset. The smartphone, according to OnePlus, is "more than just specifications," and there's equal emphasis on the design, performance, camera, and battery life as well. Of course, the Snapdragon 835 processor, 8GB RAM option, 3.5mm earphone jack, and iPhone 7 Plus-like design have all made it through to the OnePlus 5, just as the leaks suggested. The smartphone is already up for pre-order in select markets, with limited-period launch offers, and will be available for wider sales on June 27. OnePlus 5 prices in the US and select European regions for the variant with 6GB RAM, 64GB storage, and Slate Gray colour are $479 (roughly Rs. 31,000) and EUR 499 (roughly Rs. 35,900), respectively. The 8GB RAM + 128GB storage variant in Midnight Black paintjob costs $539 (approximately Rs. 35,000), and EUR 559 (about Rs. 40,000) in the US and the select European markets, respectively. The smartphone is already up for pre-orders in those regions, with an Early Drop system that will see shipments begin on Wednesday, June 21, a full six days ahead of general sales that begin on June 27. Early Drop pre-order buyers will get special launch offers as well. Interested consumers can use the Early Drop code "Clearer Photos" to initiate pre-orders. There was no word on the OnePlus 5 price in India, as expected, so everyone will have to wait till Thursday's India launch event to find it. However, previous leaks have suggested the OnePlus 5 price in India will be Rs. 32,999 for the 6GB RAM + 64GB storage variant, while the model with 8GB RAM + 128GB storage is said to cost Rs. 37,999. The company will host the launch event in Mumbai on Thursday, followed by pop-up events - where fans can purchase the smartphone offline - in New Delhi, Mumbai, Chennai, and Bengaluru the following two days. Amazon India has confirmed that sales of the smartphone will begin from 4:30pm IST on Thursday, June 22 itself. Let's start with the dual rear camera setup. The OnePlus 5 is claimed to sport what OnePlus calls the "highest resolution dual-camera system on a smartphone today". This is made up of a 16-megapixel main camera (Sony IMX398 sensor, 1.12-micron pixels) with an f/1.7 aperture, said to capture 34 percent more light than the OnePlus 3T (which had an aperture of f/2.0), coupled with a 20-megapixel telephoto camera (Sony IMX350 sensor, 1-micron pixels) with an f/2.6 aperture. The company is also boasting of Fast AF, which gives the OnePlus 5 faster autofocus, said to be 40 percent speedier than the OnePlus 3T. The rear camera setup features a dual-LED flash module and boasts of 4K video recording with EIS. The dual camera setup, apart from Bokeh effects, also delivers optical zoom up to 1.6x, and lossless zoom up to 2x (1.6x optical + 0.4x Smart Capture multi-frame tech). Magnification goes up to 8x with Smart Capture tech. The rear camera setup also supports the new Pro Mode, with options like ISO, shutter-speed, white balance, a histogram, gyroscope-based reference line, and RAW image editing. OnePlus also announced an improved HDR algorithm, and brought forward its Smart Capture feature for auto adjustments. As for the front camera, the OnePlus 5 sports a 16-megapixel front camera with a 1-micron pixel Sony IMX371 sensor, an f/2.0 aperture, and EIS. It can shoot full-HD (1080p) video. The front camera can also activate screen flash, with three modes to choose from - On, Off, and Auto. There's also an Auto HDR mode. 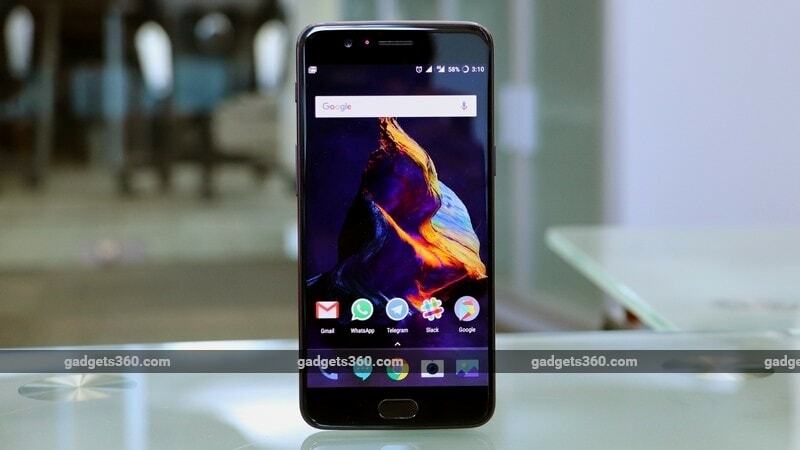 Getting to the Qualcomm Snapdragon 835 SoC used on the OnePlus 5, the company reveals the octa-core processor has a maximum clock speed of 2.45GHz, and claims that the coupled Adreno 540 GPU offers up to 25 percent more graphical performance. With the launch of the OnePlus 5, the company has joined the elite ranks of manufacturers offering smartphone with 8GB of RAM. Till date, only the Asus ZenFone AR holds that distinction. OnePlus is offering the smartphone in two memory and storage variants - 6GB RAM/ 64GB inbuilt storage and 8GB RAM/ 128GB inbuilt storage. The OnePlus 5 sports LPDDR4X RAM, which OnePlus claims is 17 percent more power efficient than the previous LPDDR4 offering. Also being touted alongside is a feature called App Priority, which learns the apps users utilise most commonly to load them on startup. Apps that aren't commonly used are deprioritised. Another performance improvement is the use of UFS 2.1 storage and a 2-lane ROM, which together are said to double bandwidth. The OnePlus 3 and OnePlus 3T were both plagued by touch latency issues, and OnePlus claims to have solved the issue on the OnePlus 5 by using high-speed cameras that track the movement of the screen and input speeds. 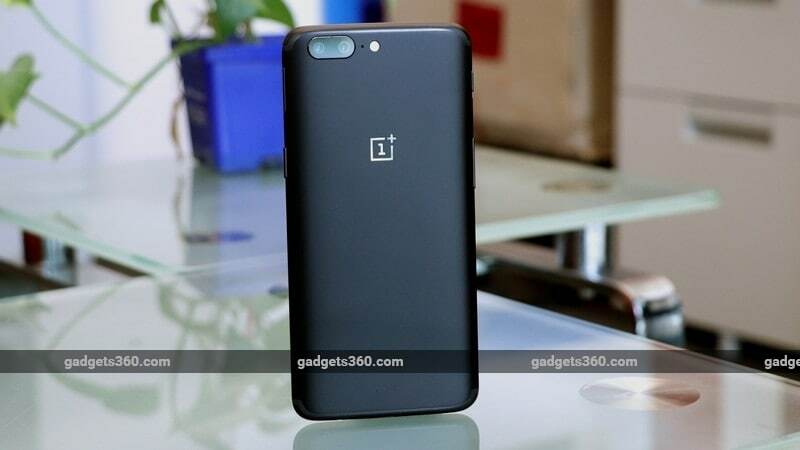 The OnePlus 5 sports a slightly smaller 3300mAh battery compared to the OnePlus 3T's 3400mAh offering, however, with "hardware and software optimisations" manages to deliver 20 percent more battery life than its predecessor. The company carries forward the ceramic fingerprint sensor on the OnePlus 3T to the OnePlus 5, with the same boast of unlocking in 0.2 seconds. The company is also calling the OnePlus 5 a "true world phone", with support for 34 GSM network bands. Finally, OxygenOS on the OnePlus 5 gets some new features including Reading Mode, Expanded Screenshots, and a semi-transparent app drawer. Let's now get to the design aspect of the OnePlus 5. The smartphone is built out of anodised aluminium and does indeed look like the iPhone 7 Plus, with the primary difference being the shape of the Home Button. OnePlus has even mimicked the antenna lines of the iPhone 7 Plus. The company is boasting of the slimness of the OnePlus 5, calling it the "slimmest OnePlus flagship ever" at 7.25mm. During the announcement, OnePlus elaborated on the design of the OnePlus 5. OnePlus co-founder Carl Pei showed off a new "continuous hard line around the edge of the phone", called the Horizon Line. The smartphone also sports more rounded corners compared to previous offerings, and also features the iPhone 7 Plus-like crescent-shaped antenna lines on the top and bottom. OnePlus 5 will be available in two colour variants - Midnight Black and Slate Grey. It retains the single speaker as well as the 3.5mm audio jack on the bottom panel. Other features carried on from previous generations of OnePlus smartphones include hardware capacitive keys (with the option of onscreen navigation) and the Alert Slider. Now let us take a closer look at the rest of the OnePlus 5 specifications. The OnePlus 5 runs OxygenOS based on Android 7.1.1 Nougat. It is a dual-SIM dual-standby smartphone with support for Nano-SIM cards. It sports a 5.5-inch full-HD (1080x1920 pixels) Optic AMOLED display supporting sRGB and DCI-P3 colour standards, and is protected by 2.5D Gorilla Glass 5. We've already detailed the SoC, memory, storage, and camera above. OnePlus 5 connectivity options include 4G LTE (with VoLTE), dual-band Wi-Fi 802.11 a/b/g/n/ac, Bluetooth v5.0, NFC, GPS/ A-GPS, and USB Type-C (v2.0). Sensors on board the OnePlus 5 include an accelerometer, ambient light sensor, digital compass, gyroscope, and a proximity sensor. It weighs 153 grams, and measures 154.2x74.1x7.25mm. OnePlus 5 comes with several upgrades over its predecessor, the OnePlus 3T. These include, of course, the dual camera setup on the back, 8GB RAM option, and updated design. There are a number of small changes that won't be apparent to users when they get their hands on the new smartphone, so you can head over to our in-depth OnePlus 5 vs OnePlus 3T comparison for a look at the differences between the two. But it's not just OnePlus 3T that the new flagship competes against, as the smartphone's primary competition is with the the top models in the stables of Apple, Xiaomi, and Samsung. You can check out our detailed OnePlus 5 vs Mi 6, iPhone 7, and Samsung Galaxy S8 comparison to find out which model is right for you.